Victory Games' The Korean War is an excellent operational-level game based on the first year of the Korean conflict that began in June of 1950. I've been enjoying this game immensely lately and I have even shelved some of my newer incoming games to keep playing this one. There's a huge campaign in the game that allows you to play through the first year of the war and the number of bells and whistles that it features are impressive (global tension, rules of engagement, use of nuclear weapons, to name a few). But before you get into the big show, there are four or five basic scenarios that ease you into the game and introduce the basic elements. The first of these basic scenarios features the first four months of the war when the North Koreans were pushing the South Koreans back and the UN held on by a thread thanks largely to the defensive perimeter near Pusan. I recently got hold of VG's The Korean War (1986) and I can honestly say that I'm blown away by the quality of this game. I'm not sure I've ever played a game where the rules were so intuitive and yet so perfectly tailored to model the kind of conflict that the Korean War really was. 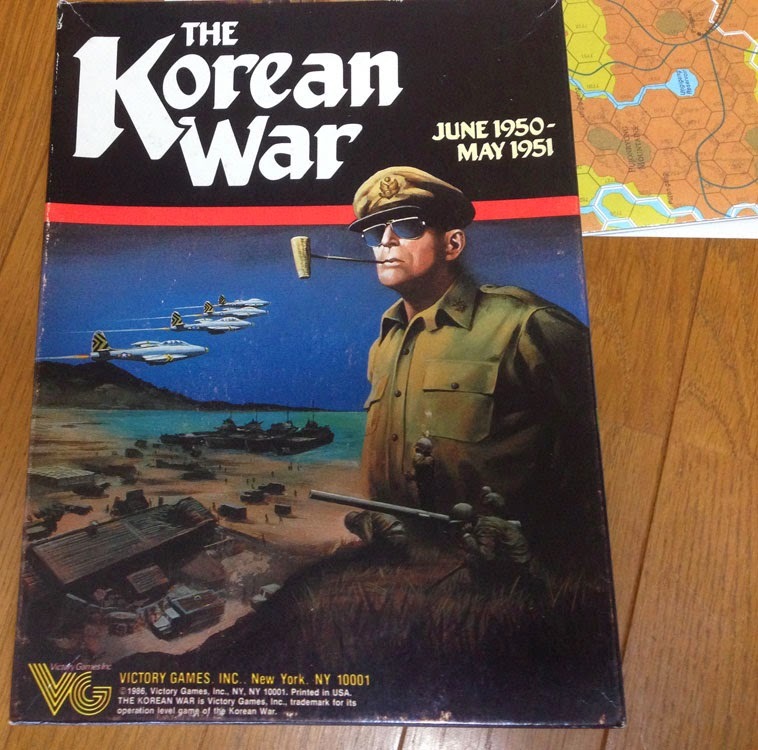 Designed by Joseph Balkoski (who also designed several games in VG's Fleet series along with many other games), The Korean War lets you play out the first year of the conflict from June 1950 through May 1951. There are four basic scenarios that take you carefully through the different stages of the war and these generally run four or five turns (one turn is one month in game time). The rules are introduced in a really gradual way and although they aren't that complex, it does take a little while to get used to the various phases and patterns of each game turn. Slowly but surely, I got halfway through a recent game of GDW's The Third World War: Battle for Germany to see things bog down into a stalemate by the beginning of turn 5. NATO's defense was sub-par due to its lack of depth and inability to cut through the Soviet breakthrough in the middle of the board. The Soviets, on the other hand, were unable to follow up their early successes with further breakthroughs and by the time, they got within spitting distance of the Rhine, the front line had bogged down as a motley collection of heavily disrupted units were unable to make the final push. 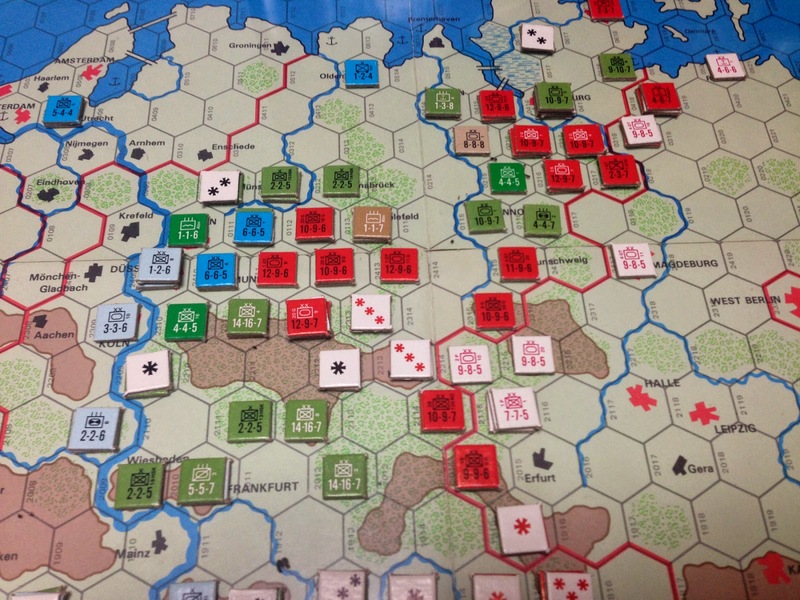 In the early game, the Soviets had an overwhelming success by clearing NATO units in the center of the board and following up with successful second echelon attacks. NATO air superiority in the subsequent turns managed to blunt the Warsaw Pact's attacks as they reached further into Germany and began to push through a few lonely divisions into Belgium. Playing "Third World War: Battle for Germany" again these days after a break from it. I'm really starting to enjoy how simple but elegant the system works and takes into account the different capabilities of both sides. To further explain, the Warsaw Pact gets two movement and combat phases, both with a second echelon phase that allows follow-up units in the rear to take advantage of breakthroughs by first line units by advancing through the breach in the front lines. Thinking more deeply about how to maximize my second echelon units, I managed to get quite a breakthrough happening in turn one as Soviets ended up making their way close to Dortmund. Yikes!